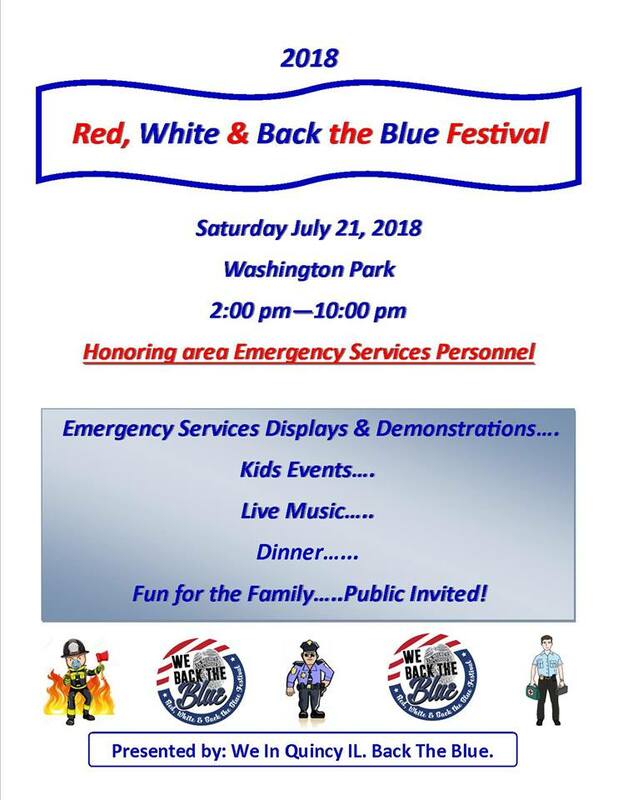 HOPE YOU CAN join us for the second Red, White and Back The Blue Festival in Washington Park Saturday. It starts at 2 p.m. and goes into the night, and our little jam band Pepper Spray is playing from 7 to 10. This event honors all of our area first responders - police, fire, ambulance and others who put their lives on the line daily to serve. We are feeding a bunch of them. 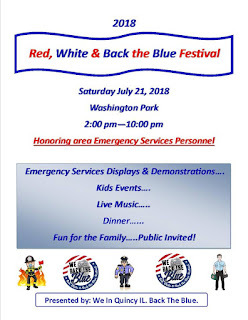 Back The Blue is free and there are lots of kids activities - you gotta see Jim Percy's magic act at 4 p.m.
We had a blast doing it last year, though from what I vaguely remember Frank Haxel opened the cooler a little bit too early and things got fuzzy later on. It was because of the heat. Right. Anyway, it's supposed to be a lot cooler and beautiful in the park Saturday, and we promise to behave this time. Ahem. These outdoor events are dependent on the weather, and it can be frustrating. Last Saturday we watched helplessly as a massive front came through just as Pepper Spray was supposed to play before a Quincy Gems game. Cori Lyssy and I are supposed to play at 6 tonight for the party on Sixth Street, but we'll have to keep a careful eye on the radar this afternoon and keep our fingers crossed. There will be no such worries Saturday. See you again in the park!